RoHS-Compliant, High-Current Inductor comes in 8787 case size. Offering rated currents from 7–100 A, IHLPÂ®-8787MZ-51 operates from -55 to +155Â°C. Max DCR varies from 0.67–39.4 mΩ, and inductance ranges from 0.47–100 ÂµH. Able to handle high transient current spikes without hard saturation, inductor is resistant to thermal shock, moisture, mechanical shock, and vibration. Areas of use include DC/DC converter applications in servers; low-profile, high-current power supplies and POL converters; and distributed power systems. 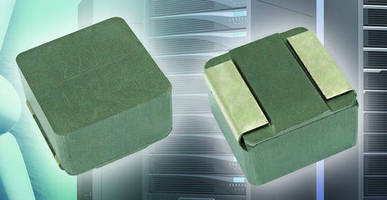 MALVERN, Pa. — Vishay Intertechnology, Inc. (NYSE: VSH) today announced a new IHLP® low-profile, high-current inductor in the 8787 case size with high rated current from 7 A to 100 A and a high operating temperature to +155 °C. The Vishay Dale IHLP-8787MZ-51 offers high efficiency with max. DCR from 0.67 mΩ to 39.4 mΩ and a wide range of inductance values from 0.47 µH to 100 µH. The IHLP-8787MZ-51 device released today serves as a high-performing, space- and power-saving solution for DC/DC converter applications in servers; low-profile, high-current power supplies and point of load (POL) converters; distributed power systems; solar inverters; and industrial lighting. The new inductor handles high transient current spikes without hard saturation. Packaged in an RoHS-compliant and 100 % lead (Pb)-free shielded, composite construction that reduces buzz noise to ultra-low levels, the device is specified for an operating temperature range of -55 °C to +155 °C, with high resistance to thermal shock, moisture, mechanical shock, and vibration. The inductor is halogen-free and Vishay Green. Samples and production quantities of the IHLP-8787MZ-51 are available now, with lead times of 10 weeks for large orders. Pricing for U.S. delivery only in 10,000-piece quantities is $4.53 per piece. Vishay Intertechnology, Inc., a Fortune 1000 Company listed on the NYSE (VSH), is one of the world's largest manufacturers of discrete semiconductors (diodes, MOSFETs, and infrared optoelectronics) and passive electronic components (resistors, inductors, and capacitors). These components are used in virtually all types of electronic devices and equipment, in the industrial, computing, automotive, consumer, telecommunications, military, aerospace, power supplies, and medical markets. Vishay's product innovations, successful acquisition strategy, and "one-stop shop" service have made it a global industry leader. Vishay can be found on the Internet at www.vishay.com. IHLP is a registered trademark of Vishay Intertechnology.